On 25 November 1862, the premises were certified to operate as an Industrial School and receive children placed under detention by the courts. An official inspection in November 1863 found that 40 children had been committed to the establishment. The girls were taught and boarded in the female orphanage under the superintendence of four sisters of the Franciscan Order. The boys were taught in the day school of the institution in which about 150 children were instructed by two young men from a religious order. They were superintended by Mr and Mrs McCulloch. It was reported that both the boys and girls seemed well cared for, but more industrial training was required for the boys. The following year, 79 boys and 27 girls were under magistrates' orders and were mixed in with the orphans and destitute children, who were maintained by voluntary contributions. Although the girls' department was found to be well managed by the Sisters, the boys' school was overcrowded. By 1865, the boys were being taught in a separate part of the building but still lacked their own schoolroom, dayroom, playground and a required greater provision for industrial training. In 1866-67, a new building was erected at the site to house the boys. It consisted of three very large dormitories and a school room, with apartments for the officers, the lavatory and workshops being built out behind on two side of the playground. No kitchen or dining-room was provided, boys having their meals in the girls' department. Up to 250 boys could be accommodate, aged from 7 to 15 years at their date of admission. The boys' industrial training now included shoe and slipper making, tailoring, carpentry, wood-chopping and paper bag making. The boys were drilled regularly and a band was started. At the end of 1867, Mr and Mrs Orr took over as superintendent and matron of the boys' department. In 1870, however, Mr Orr died after an attack of fever. Mr and Mrs Lewis Mackenzie were then appointed as superintendent and matron. After 22 years service, Mr Mackenzie resigned due to failing health. He was succeeded as superintendent by Mr William Devine, who had been a teacher at the School since 1877. Mrs Devine was appointed matron. 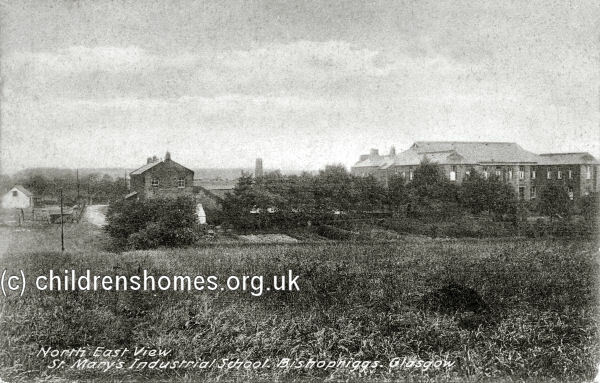 St Mary's Roman Catholic Orphanage and Industrial Schools site, Glasgow, c.1893. An inspection report in 1896 recorded 200 boys at the School, with 57 out on licence. The School was described as an institutional building in a poor part of the town, and its situation was a bad one. On one side it overlooked a disused burial ground, while the other was hemmed in by the backs of the houses in Abercromby Street. In the classroom, performance in geography, recitation, mental arithmetic and recitation were rated as generally fair. History and singing were planned to be added to the curriculum. The location of boys to industrial training was: 19 tailors, 21 shoemakers, 23 bagmakers, 72 chopping firewood, 2 van boys, 2 engine boys, 2 door boys, 9 house boys. The flute and drum band had 25 members, whose services were in some demand. Physical and military drills were given, hut the space for them was confined. The playground was small, about 50 yards by from 10 to 20 yards. In the summer the boys went out to the Alexandra Park once a week, and on the second Sunday of each month they went on their own to visit friends. Each year they had a treat to the coast, and another into the country. Various entertainments, such as magic lantern shows etc., were arranged in the winter. There was a library of 150 volumes and simple table games were also provided. In light of the confined situation of the buildings, it was suggested that it would be highly desirable to relocate the School to the countryside. Also in 1899, a site on which to build new premises was acquired on the Kenmure estate, near Bishopbriggs, four miles to the north-east of Glasgow. 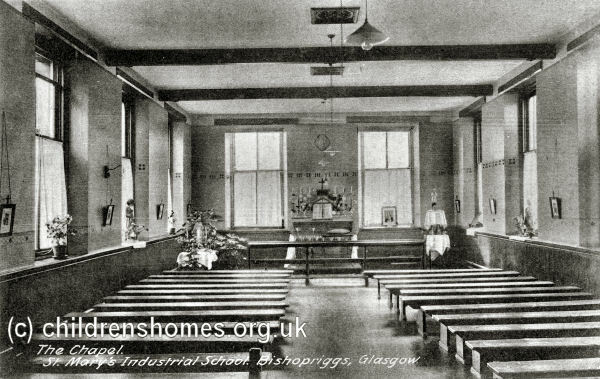 The initial intention appears to have been for bothe the boys' and girls' school to relocate to Bishopbriggs but ultimately it was only the boys' department which moved. Mr and Mrs Devine departed in May 1901. Mr A. Mathieson was then appointed as superintendent. In 1903, drawing was added to the industrial training, with the introduction of cabinet making also being planned. Three weeks were spent at camp in the summer. Mrs Mathieson was appointed as the School's matron in August 1904. Th move to a new site at Bishopbriggs finally took place in 1905. The purpose-built premises were formally certified for use on 18 July 1905, with accommodation for 200 boys. The official opening, by Archbishop Maguire, took place on 18 October 1905. The School site is shown on the 1910 map below. 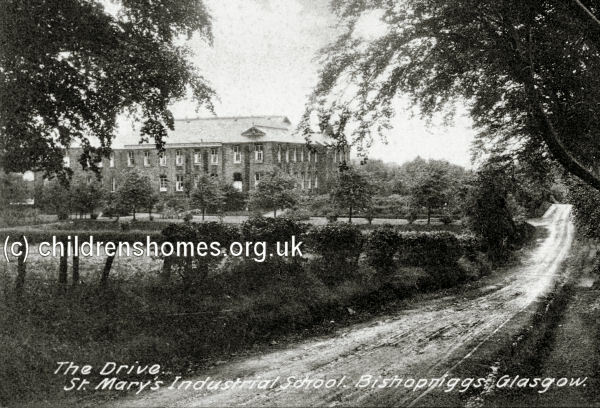 St Mary's Roman Catholic Boys' Industrial School site, Bishopbriggs, Glasgow, c.1910. Industrial training at the new site included tailoring, shoemaking, drawing and manual instruction in woodwork. Baking was introduced in 1907, with plans to add metalwork. Physical raining included Swedish drill and exercises with dumb-bells, bar-bells, Indian clubs and staves. In 1908, female teachers were introduced into the classrooms. The superintendent gave lessons in horticulture and machine parts. Mr Mathieson was still superintendent in 1911. The other staff then comprised: matron and nurse, Miss M.D. Fraser; head schoolmistress, Miss S.A. Bradley; assistant schoolmistress, Mrs M. Malone; yard and drill master, assistant yardmaster, bandmaster and engineer, tailor, joiner, shoemaker, cook and baker, laundress, kitchen maid. Resident chaplain, Rev. P. Kerr. Medical officer, Dr. Scanlan. 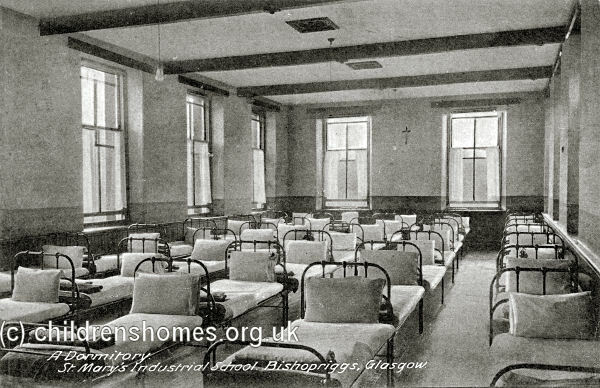 In February 1919, an Auxiliary Home serving the St Mary's and Slatefield Industrial Schools was opened at 84 Henrietta Street (now Orr Street). Hostel-style accommodation was provided for up to 100 boys on licence or recently discharged from the two establishments. 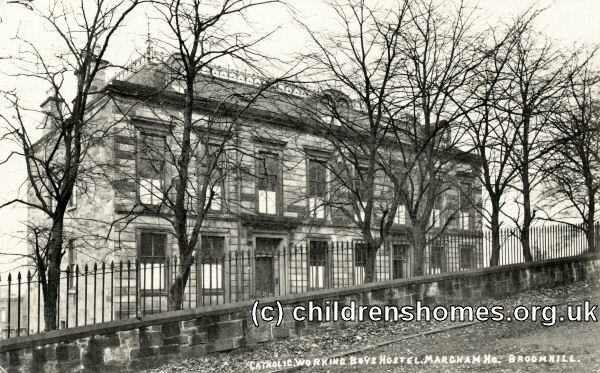 In August 1927, the home was relocated to Margham House, Broomhill Road, Partick, again housing up to 100 boys. 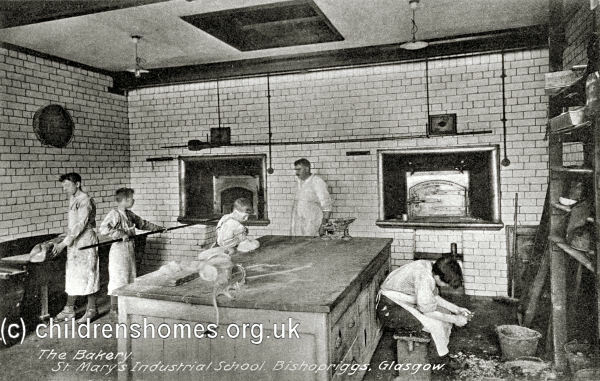 From 31 March 1930, the School became officially known as Kenmure St Mary's Boys' School, Glasgow, with its accommodation set at 150 places. 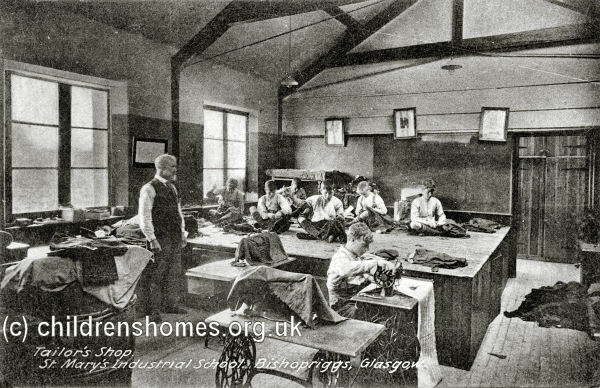 In 1933, the establishment became an Approved School, one of the new institutions introduced by the Children and Young Persons (Scotland) Act to replace the existing system of Reformatories and Industrial Schools. It could accommodate up to 150 Junior Boys aged from 7 to 13 years at their date of admission. 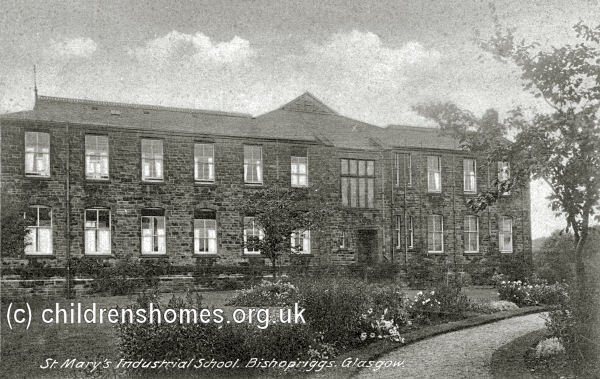 On 15 May 1934, Bishopbriggs also became home to the Kenmure St Mary's Girls' School, accommodating up to 40 girls aged from 6 to 12 years. Exactly where they were housed in unclear, but they may have occupied Kenmure House, the old mansion on the site. This arrangement ceased in 1954 when the very bad state of the girls' building led to its certificate being withdrawn. 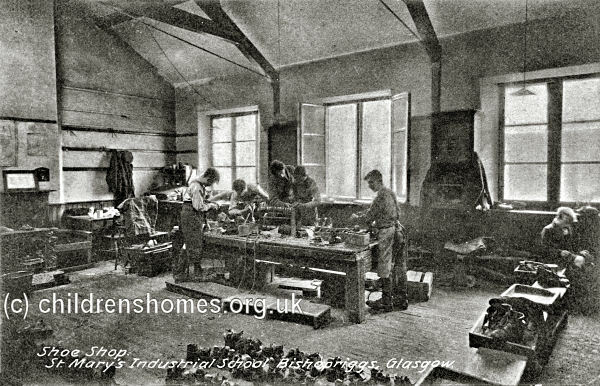 In 1943, the boys' school was described as giving a practical training in farm and garden work, wood and metal work, tailoring, shoemaking, baking and cookery. There was a school band. The headmaster was now the Rev. Brother Patrick. In the girls' department, the headmistress was Sister Mary Mercy Dollard. Instruction was provided in cookery, laundrywork, needlework and housewifery. Following Scotland's 1968 Social Work Act, the School was redesignated as a 'List D' School. A secure unit was opened at the site in 1976. The School buildings no longer survive.